Towards a couple of sample Oracle Database sample exercises that we have in mind wanted to make sure that our all purpose database client, DBeaver, is able to communicate with an Oracle Database. The version of JDBC Client that we need will be based on the version of JRE that is installed or will be installed on the computer. And, so let us establish that first; that is determine the JRE Version Number. 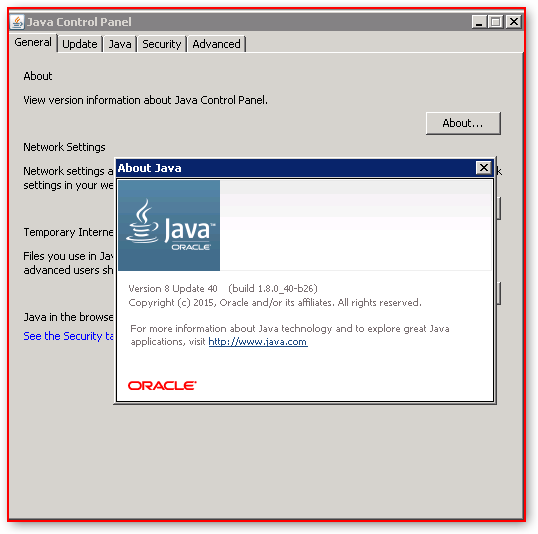 Using Control Panel, find and launch the Java applet. Once Java Control Panel window appears, please access the “General” tab. Review the Version Numbers listed and exit the “About” panel, once satisfied. Next access the “Java” tab and review the System and User settings. Within the Java tab, we are able to enable and disable each installed JRE package. They are listed by Version #. Please visit Oracle’s JDBC download web site. And, the current version# is 12.1.0.2. We do not need support for NLS, National Language, english is sufficient. And, we do not need tracing and logging as will not be developing code and thus need to capture code related errors and instrumentation. In short, the base package, ojdbc7.jar, is sufficient. Please download the Jar file and move it to a location where you will like to have it available to our Client, DBeaver. Please launch DBeaver and let us review and configure the list of JDBC Drivers. And, also configure connections to our various Oracle Database hosts. The list of Drivers currently availed is accessible through the menu items Database \ Driver Manager. Please click the “Database” / “New Connection” menu item to create a new connection.